As a member of the web content department, my principal job is to come up with creative ways to describe the history or meaning of each product. Most of what I write about isn’t anything particularly new. The ideas and meanings are out there and have been out there for quite some time, and all I do really is assemble the ideas together with consideration to the variations of the ring and try to understand what might make a client pick one style over another. Writing those descriptions take a lot of time and while consumers may not necessarily read all of them, we still take the time to do it because it may be something a client looks to in order to help them to make their final decision on which product that they want. In this way, we believe that they are an amazing shopping aid for our customers and believe that helps to make their experience with us a great one. In this post, I’ll be going over how my department goes about writing descriptions about the meaning and history of a wedding ring. For example, let’s take a look at a Blue Sapphire Channel Set Eternity Band. An eternity band to begin with is a wonderful style of ring where precious gemstones go all the way around the band creating a full circle and thus representing eternity because there is no beginning and no end. However, most eternity rings used for wedding bands are typically crafted with white diamonds to match an engagement ring with similar accent diamonds. While this may be the case, what about the bride who doesn’t necessarily like diamonds? What if the engagement ring includes blue sapphires in its design and the bride to be wants that more emphasized in the wedding ring? Or what if the bride just wants a wedding ring of blue sapphires because it carries some meaning and history with it that’s atypical? All of these are examples of of things that we think consumers may consider while they’re shopping and why this product might be chosen. The blue sapphire for instance is a stone that represents sincerity, fidelity, wisdom, and honesty. Those are wonderful ideas to incorporate with wedding vows, and flesh out and add a bit of personality into your big day. The diamond is the classic stone and because of its hardness it represents eternity, and has a very pure look to it because of its clarity and whiteness, but everyone chooses it and maybe you would want to emphasize something else other than eternity with the gemstone since your eternal devotion is already expressed from the eternity ring style. 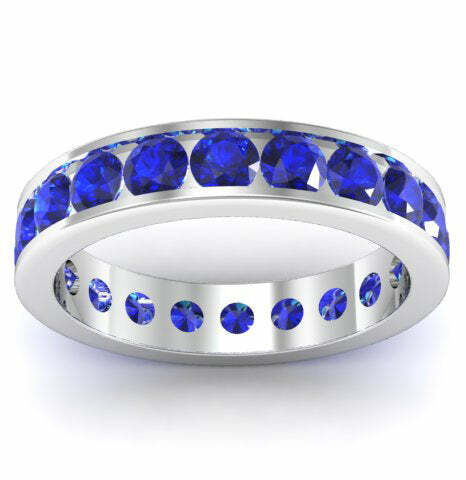 It’s also feasible that an eternity ring with blue sapphires might be chosen as a wedding ring because it is a birthstone for September and maybe they wanted to add a personal touch with their own birthstone or maybe someone very special to them wanted the union to happen, so the birthstone choice could represent their blessing. Historically speaking as well, the blue sapphire has also been used in royal or celebrity jewelry for quite some time. The most recent and popular example is the Kate Middleton/Princess Diana engagement ring. It’s perfectly reasonable to think that while a bride may have wanted a different style for their engagement ring, they may have wanted to give homage to the rich history of blue sapphires in their wedding ring because it is still a beautiful stone that has been used in jewelry for centuries. There’s also some consideration to meaning given to the shape of the gemstone as well since the example ring above uses round blue sapphires, but we also offer a version with princess blue sapphires. Just as I mention in my previous piece about diamond shape (which applies equally to shapes of other precious gemstones), a round is more traditional and emphasizes honesty and faithfulness while a princess cut is for the woman who likes enjoying life and being a trendsetter. These little details add extra bits of individuality to be expressed in your wedding jewelry and that can be important for some shoppers. The round shape might be a stronger choice for someone who really wants to show their sincere devotion, but a princess cut might be considered by someone who wants to show how their relationship includes a certain degree of whimsy. There can be any number of reasons that someone might choose a particular ring to be their wedding ring. In the end, what matters is the meaning that you give to the ring yourself. The only thing that we do in the web content department is give you ideas when we write our descriptions in order to help you to decide. We sincerely hope that they are a help to you and while not all of them may be read by our clients, we strive to make sure that the information is there should it be needed. At the end of the day, what matters most is that our clients are happy and by putting together descriptions that incorporate these ideas, we think that it helps our shoppers to have a pleasant experience with us.